ALS. 3pp. Incorporating a full-page ink drawing. 7 Fitzroy Street, London. 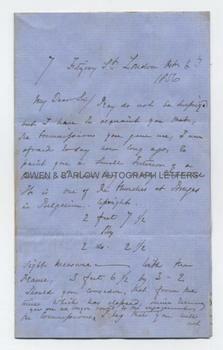 October 6th 1856. To Thomas Miller, Esq. "Pray do not be surprised, but I have to aquaint you that the commission you gave me, I'm afraid to say how long ago, to paint you a small interior of a church, I have very nearly completed. It is one of the churches in Bruges in Belgium. Upright 2 feet 7 and a half by 2: do. 2 and a half. Sight measure - with the frame, 3 feet six and a half by 3 ditto 2. Should you consider that from the time that has elapsed since receiving the commission you are no longer bound to the engagement I beg that you will not stand on the slightest ceremony, and at once saying so - and I can only add that it has arisen from not want of respect and regard for you but to the contrary. The large works I have at various times been engaged upon, has [sic] kept me from taking subjects of this size, and although I admit that your friend and neighbour, Mr [. . .?] has got at different times I think two small subjects, yet they were begun for the love of the subject for the moment, without regard as to who might become the purchaser - as far as my own impression goes - with you, I was tied back by the subject and size. I much wish you could see it, as you cannot, here is the outline. Again, stand on no ceremony. With kind and best regards to Mrs Miller. Believe me, faithfully yours, David Roberts". 8vo bifolium. Approx 7 x 4.5 inches. The pen and ink drawing of the interior of a church occupies the whole of the first page of the second leaf. 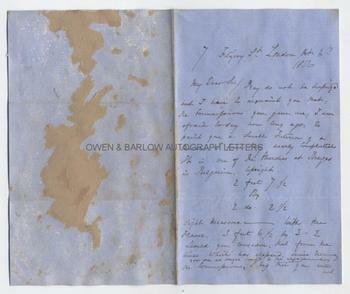 Mounting residue to the blank verso of last leaf with some loss of the blue pigment in the writing paper. All else VG. David Roberts was persuaded by JMW Turner to become a full-time artist and made his name with his series of illustrations of Egypt and the Holy Land that became best-selling lithographs. david roberts had returned from a tour of Italy in 1853 and after that time was heavily engaged in producing a series of large oil paintings of Italian subjects which were later published as engravings in 1859. 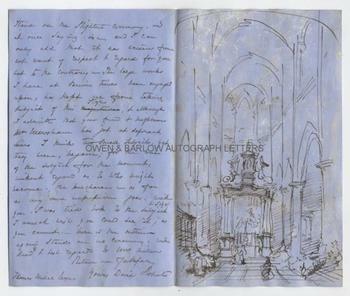 It appears from this letter, that David Roberts had neglected some of his smaller commissions, including the painting of the Belgian church, which he illustrates in this letter. Provenance: From the 19th century album of Emma Marshall of Penwortham Lodge, Preston. Emma was the daughter of William Marshall, land owner and cotton manufacturer and was related by marriage to the Miller family of baronets, M.P.s and landowners, one of whom, Thomas Miller, was the commissioner of this painting from David Roberts.